• the Cape Cod sanctuary whose sweeping seaside vista is accented with mounds of fragrant lavender and a delightful herb and vegetable garden. • the tropical oasis—in Colorado!—housed in over 450 containers that burst with color and interest. • the tiny urban plot that lives gracefully large as a secret city oasis. • the wild natural beauty composed of native stones, perennials, trees and shrubs in a garden that practically takes care of itself. 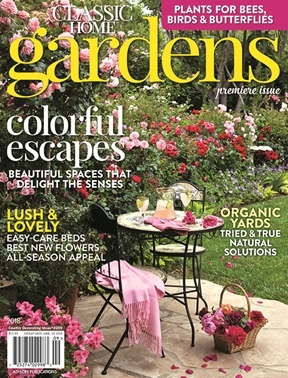 • the most prolific rose garden to have started with just three iceberg varieties (you get a hint of it on our cover!). Along the way, we share tips on how to plant a low-maintenance landscape that stands the test of time and update you on the latest in plantables at the market this spring. Plus, we round up must-visit flower shows and events this spring in some of North America’s best botanical gardens. Go ahead—dig in!